Final Fantasy X-2 review Game Over Online - http://www.game-over.com Squaresoft’s mastery of Role-Playing Games is globally known and completely undisputed; however, 2003 will probably go down in gamer’s minds as the year that the developers of the seminal Final Fantasy franchise redefined their own standards, releasing two firsts for their company. 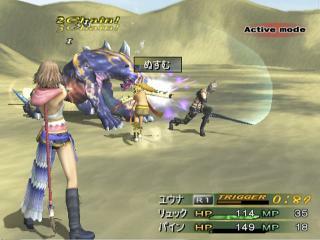 First came Final Fantasy XI, an online RPG for both PCs and PS2s as well as an online service for gamers. Most players were shocked by this new opportunity to connect to fellow players, but the next announcement truly amazed RPG fans. Up till now, every successive title in the Final Fantasy series was set in a new world with new characters, villains and environments. However, Square Enix’s Final Fantasy X-2 returns to the lands of Spira from Final Fantasy X, arguably one of the most popular games in the series, with a new set of adventures for gamers to explore. 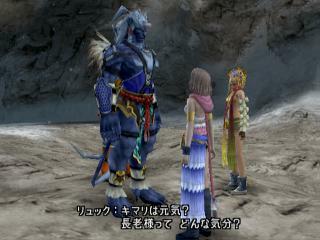 Before I start to go into the story of X-2, I want a show of hands of those people that haven’t played Final Fantasy X yet. Those of you who find their hands raised, stop reading this now, get to the store, and buy that game. I’m not kidding, the rest of us are going to sit here and wait……..
Keep going…. halfway through, aren’t you? Ok, good, took you long enough, but it was well worth it, right? Well, X-2 takes place two years after the end of Final Fantasy X during the period known as the Eternal Calm. Now that Sin has finally been defeated and Spira has returned to a peaceful existence, Yuna’s job as a high summoner of Yevon is in limited demand – non-existent, actually. With the lack of threats to the people of Spira, Yuna turned her fame as the savior of the world into a new profession, that of a world famous pop star. However, her hunger for adventure hasn’t waned; along with Rikku, (a quirky former guardian of Yuna’s) and a new colleague, a reserved warrior named Paine, Yuna’s formed the Gullwings, a group of fortune hunters that go after spheres. Akin to advanced camcorders, spheres record different events, historical documents or personal data for citizens of Spira. Thanks to previous invasions of the land by Sin, these items have been scattered throughout the world, and are rather valuable pieces of property. One day, Rikku approaches Yuna with a sphere whose video displays an image of an imprisoned Tidus, spurring the Gullwings to search for their missing and endangered companion. Unlike previous Final Fantasy titles where you constantly hoof your way across the plains and numerous continents, Yuna and her fellow hunters explore and rediscover Spira in style aboard the Celsius, the Gullwings’ personal airship. Thanks to the Celsius, Yuna and her squad can take off and investigate just about any area on the world map. 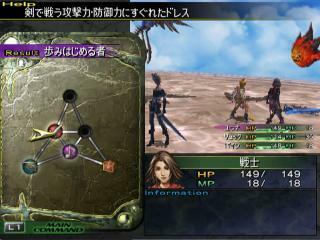 Certain areas are designated as “Hotspots,” regions necessary to advance the basic plot of the game. While the number of these areas will vary based on the chapter of the game you’re in, they actually serve a secondary purpose: that of fostering investigation of side quests in outlying territories. 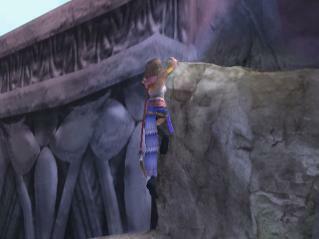 Players of Final Fantasy X will immediately recognize a majority of the areas found within X-2, but will notice the major changes that have affected every part of Spira since the defeat of Sin. Not only will people allude to these moments in conversation, but also Yuna or Rikku will often find themselves commenting on some memory of journeying through that place. However, returning to these areas is necessary to power up our three heroines, as well as add vital items or weapons to your team. Players won’t be resigned to side quests either. Mini-games also abound in these remote sections of the map, which provide a healthy diversion from the constant dungeon crawling as well as a chance to acquire money or objects. Some of these objects can be dresspheres, items that impart new abilities and skills upon our lucky trio. 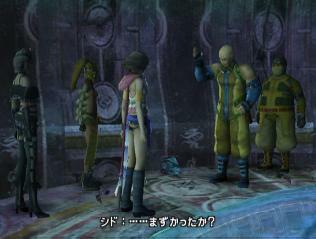 Mutating the Sphere Grid concept from Final Fantasy X, characters equip a Garment Grid (a limited Sphere Grid itself) and accessorize it with dresspheres. Taking the place of classes from previous Final Fantasy games, such as a Red Mage or a Thief, dresspheres impart “jobs”, specialized costumes that give new talents to Yuna, Rikku or Paine. Creatively, these costumes can be changed on the fly during a combat to maximize the amount of damage created or react to the resistances of the monsters you’ll encounter. Much more than the typical fighter or magic user seen in previous games, you’ll also be introduced to quirky jobs such as the songstress, the gun mage and the mascot. What’s more, you’ll also have the option to gain each character’s ultimate dressphere, a powerful object akin to many of the summoned beings from previous Final Fantasy games. Obviously, this dressphere system comes into play primarily in battle when you’re facing off against any number of creatures. 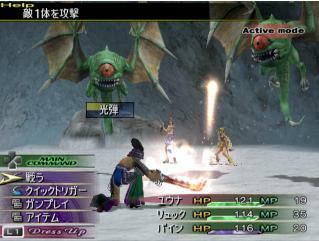 Final Fantasy games have been governed primarily by the Active Time Battle system, one that allows attacks based upon the filling of a gauge at the bottom of the screen. This system has been significantly tweaked in X-2, most noticeably by the inclusion of a much faster battle system. 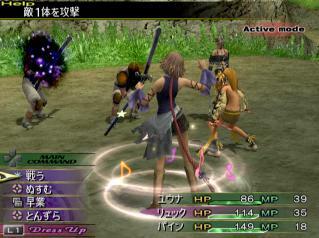 Not only will Yuna, Rikku or Paine attack almost immediately after inputting a command, the trio has an option to actually interrupt enemy attacks in mid-swing based upon the timing of the player. Even better, those with exceptional timing can inflict higher amounts of damage by triggering combo attacks if they land multiple attacks within a limited window of opportunity. This can further be boosted with the triggering of individual job abilities, some of which multiply the hits or damage inflicted into enemies. What this all boils down to is switching your costumes back and forth to get the most effective squad of warriors and working on your timing to constantly disrupt opponents. I’d be remiss in saying that X-2 was anything less than a gorgeous game, primarily because of the wizardry shown by the experts at Square. Along with the breathtaking full motion video sequences and the impressive in-game cinematics, you’ll find huge character models within detailed, well-animated backgrounds. Even minor cutscenes, such as the ladies switching from costume to costume, are beautifully done and full of light and particle effects. However, there are two caveats with X-2’s presentation. First of all, you’re not really seeing anything that Final Fantasy X couldn’t do. In fact, many of the models, environments and effects have been re-purposed from the previous title, which is certainly disappointing. Don’t get me wrong, this isn’t entirely a bad thing, considering that Final Fantasy X is one of the prettiest RPGs on the market, but you’d hope there’d be something a little more outstanding than the numerous costumes that Yuna, Rikku and Paine can change into. The other major issue is the perceptible amount of slowdown, which can bring gameplay to a crawl, especially when the game is tracking a number of effects from an attack. Vocally, X-2 is as solid as its predecessor, with a solid performance turned in by just about everyone. While certain moments of the game will feature a lag in dialogue as the game shifts camera perspectives for a scene, the voice actors capturing the optimism of Yuna, the childlike glee of Rikku or the solemn attitude of Paine are dead on with the characters portrayed. This is the kind of acting that other games should try to model their dialogue on. Sound effects, like many of the graphics, have been pulled from Final Fantasy X, which isn’t bad, but also isn’t as spectacular anymore now that it’s been released. The music, however, has received a significant upgrade (which makes sense considering that one of the jobs available to the ladies is a songstress). Mainly comprised of numerous synth and J-Pop style influences, there’s a lighter, jauntier feel to the game in general, even during some of the more serious moments. While many people may gripe that X-2 is more like a kind of expansion pack than a full sequel thanks to the way it’s presented, that really isn’t the issue that clouds the game’s play. As I can see it, there are two factors that start to complicate the game, somewhat affecting its gameplay. 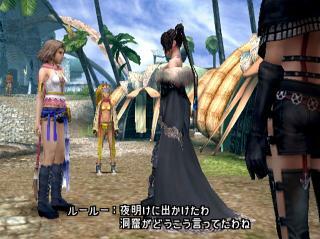 The first is the lack of additional characters that can join the party to affect the plot or gameplay. Every other Final Fantasy title has involved some kind of acquisition of new warriors that changes the dynamic of the party and affects the plot in a number of ways. The restriction of Yuna, Rikku and Paine really does make the party seem stale in some way, no matter how many times you’ll change your outfits. Maybe that’s simply because unless players are looking to augment a specific skill or max out their grid, they could tire of this convention. The other issue is the sheer amount of dependence upon the previous title and side quests to fully gain enjoyment of this title. The reason why I brought up the fact that you should play the first game is because there’s quite a bit of information and character development that has occurred from the first to the second, along with certain plot points that simply won’t make any sense without that foundation from the previous game. What’s more, there are so many secondary and tertiary elements to be found within side quests that to fully track them all or take advantage of the complete story, you’ll need a strategy guide, hands down. Brady Guides actually happens to have two great ones for this game, the regular guide for players that need to negotiate Spira, and the Limited Edition, which also includes concept and environmental art from Final Fantasy X and X-2. If you have the means or are a fan of these games, get your hands on the limited edition now. Squaresoft’s mastery of Role-Playing Games is globally known and completely undisputed; however, 2003 will probably go down in gamer’s minds as the year that the developers of the seminal Final Fantasy franchise redefined their own standards, releasing two firsts for their company. 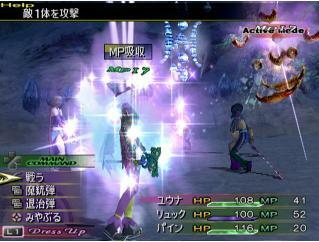 First came Final Fantasy XI, an online RPG for both PCs and PS2s as well as an online service for gamers. Most players were shocked by this new opportunity to connect to fellow players, but the next announcement truly amazed RPG fans. Up till now, every successive title in the Final Fantasy series was set in a new world with new characters, villains and environments. However, Square Enix’s Final Fantasy X-2 returns to the lands of Spira from Final Fantasy X, arguably one of the most popular games in the series, with a new set of adventures for gamers to explore. 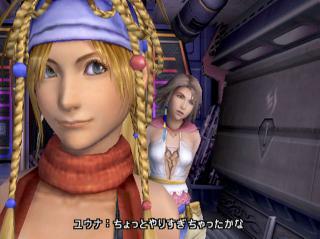 Cyndi Lauper once said, “Girls just wanna have fun,” but Yuna, Rikku and Paine must be having a blast being adventurers in X-2. 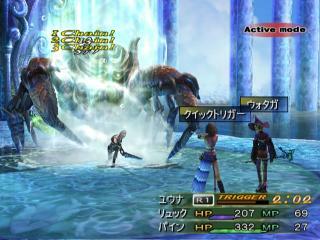 While many technical elements are rehashed from Final Fantasy X, the lack of playable characters is a significant stretch for latter Final Fantasy titles, and a strategy guide is a sheer necessity (not even close to being optional), the plot, battle system and dresspheres/job classes provide plenty of play for 60+ hours of adventure in the land of Spira. RPG fans should take a look at this sequel, because they could find a solid game to while away this holiday season with.